Includes flipfold capability for access to third row seating, manual recline and 2 fixed child anchors and tethers. Includes power adjustable pedals, power rear quarter windows, universal garage door opener and reverse sensing system. Includes 18" X 8.5" machined aluminum wheels, P255/70R18 all-season OWL tires and a-gloss Dark Shadow Grey bodyside cladding on wheel lip moldings and front and rear lower fascia. Includes four corner load-leveling with message center. Includes 18" X 8.5" machined aluminum wheels and P255/70R17 all-season OWL spare tire. 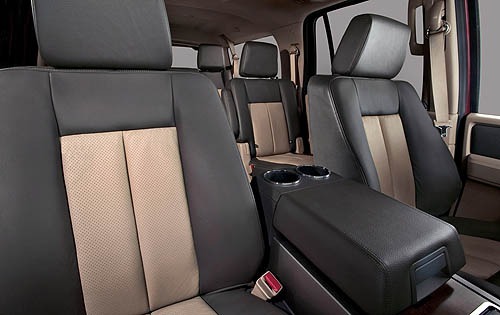 Includes leather-trimmed captain's chairs with two-way adjustable headrests, 10-way power driver's seat with memory, power lumbar and power recline, passenger manual lumbar, center floor console with a floor shifter and a leather-wrapped steering wheel. Includes manual air conditioning with auxiliary climate controls, overhead console with map lights, sunglasses holder, front auxiliary air controls and conversation mirror (mini console with moonroof), 2nd row map lights and upgraded visors with dual illuminated mirrors. Required on all units ordered by dealers for California Emissions States registrations when the vehicles are being delivered to non-California Emissions, non-Cross-Border States locations. Also requires 422 California Emissions System. Includes AM/FM stereo with 160 watts, a clock, 6 premium speakers, driver adjusted speed compensated volume, radio data system (RDS), partitioned audio, rear seat controls and MP3 capability. Includes 4-pin and 7-pin wire harness, heavy duty auxiliary transmission oil cooler, heavy duty radiator, Class IV hitch/receiver and electronic braking wiring kit. Includes electrochromic rearview mirror, keyless entry keypad and adds heat functionality to the standard power mirrors. Includes skid plates for the front transfer case and fuel tank and black tubular step bars. Control code for units either shipped to California Emissions States dealers or ordered by California Emissions States dealers for registration in non-California States locations. In Maine and Vermont, dealers cannot order vehicles for customers in non-California Emissions States locations (except Public Service/Emergency Vehicles-936).